Born in 1865, he was tonsured a monk in 1891, and consecrated a Bishop in 1891. From 1900, he was Bishop of Alaska, with oversight of the Church throughout North America. In America, he consecrated the first Orthodox monastery on the continent and worked tirelessly to unite all ethnic groups as one flock. In 1907 he was made Bishop of Yaroslavl and returned to Russia. In 1917, he was elected to be the first Patriarch of Moscow since the abolition of the Patriarchate by Tsar Peter the Great more than 200 years before. Almost immediately, the Russian Church was plunged into new and terrible persecution as an atheist and totalitarian government seized control. 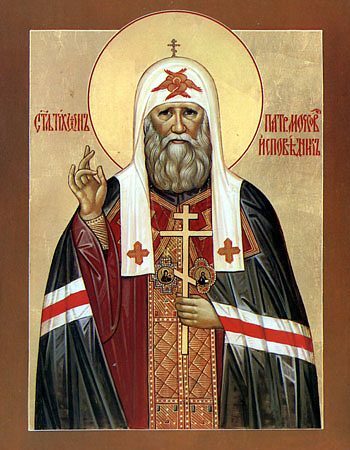 Patriarch Tikhon always sought not to quarrel with the Communist government, but his refusal to deny his faith or his Church marked him in their eyes as an enemy. In 1925 he died under mysterious circumstances, and is generally thought to have been murdered by the Soviets. He is commemorated as a Confessor, and by many as a Martyr also. Note: because his commemoration falls on the Feast of the Annunciation, his service is usually transferred to the day before or after the Feast.